I want to talk about prayer journaling but first, how’s your prayer life? No really, How.Is.Your.Prayer.Life? And please, don’t tell me “good” or “fine.” I tell my children on occasion (ahem), “I don’t know who you think you’re fooling but it isn’t me and it isn’t you.” So I ask the above question in all sincerity. And I completely respect your privacy–you don’t have to answer me. It is important that you spend some time thinking through it for yourself though. If prayer is a conversation with God–how are your conversations? Hurried? Scattered? Distracted? Non-existant? You talking–talking–talking, but not listening? If it makes you feel any better, me too. Yep, me too–to all of the above. Not all the time, but absolutely some of the time. For those times when I feel like I’m struggling, or more importantly when I’m struggling and don’t feel like it, I have found a prayer journal to be a tremendous help. So what is a prayer journal and what is prayer journaling? There is no easy answer to that question. 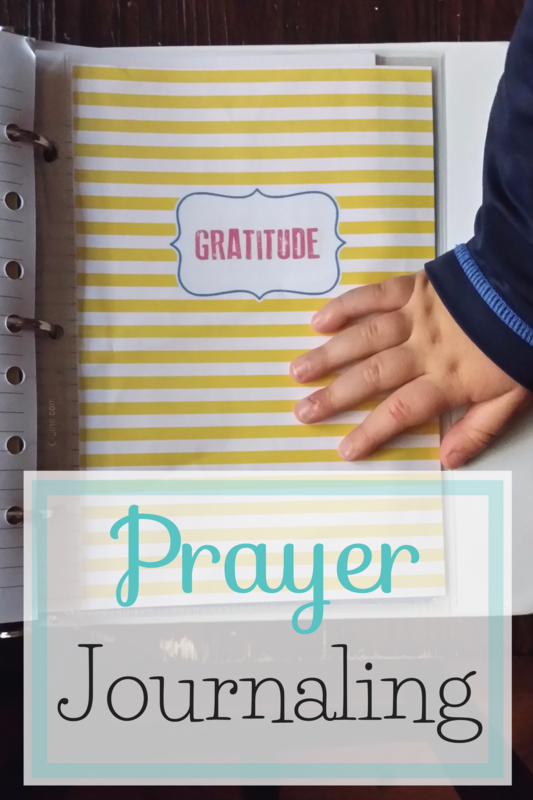 A prayer journal can take so many different forms: cheap spirals, fancy journals, three-ring binders, Travelers Notebooks, pocket calendars; I could literally go on and on. And what is prayer journaling? Again, no easy answer. Prayer journaling can be long hand prayers written and prayed over, formal prayers copied, columns of “Petitions and Answers,” reflections on quiet time spent with God–there really isn’t a right or wrong way to make and keep a prayer journal–scroll Pinterest, you will totally see what I mean! Just because the topic of prayer journaling is extensive, doesn’t mean I’m going to shy away from it. Look, I struggle with prayer at times. I believe we all do in our own way. I also think too many people are afraid to admit their prayers are dry, rote or even non-existent. So I’ll step up and do it. I created my first prayer journal after spending an evening visiting with my girlfriends–fellow mommas. And I realized, “Jenny, you have to step up your prayers for your kids.” I realized I couldn’t rely on throwing my prayers up some throw pieces of spaghetti–testing them to see if they stick. I also couldn’t pray me heart out hoping to change God’s mind. Yes, I did just go there. I realized my prayers need some heart, soul, and legs to stand on. Basically, I needed some intention and direction in my prayer life. When things are bumpy, stormy, and troubled–my prayer game is on target! When things are going smoothly…eh, not so much. Yep, I just went there too. I told you, I’m going to be honest about the difficulties in my prayer life. I want to take away any stigma that it’s a weak faith or lack of faith that produce difficulties in prayer. I want to show you, you can love Jesus with all your heart, mind, and soul–and still struggle with prayer. I’m going to keep a running list here on this page of all the things I have to say about making a prayer journal, changing prayer journals if the one you just made isn’t working for you–uh-huh, went there also ands welcome the last year of my life–chasing the “Perfect Prayer Journal.” I’m also going to share what works, when it works. I’ll share ideas, inspirations, and resources on prayer journaling so keep checking back for the latest prayer journal posts.